The overarching goal of the food web study is to further explain the complex structure and functioning of the deep sea food web off Central California, with a primary focus on the role of understudied midwater animals. Biochemical markers such as stable isotopes, fatty acids, and trace metals, have been used with great success in deep sea ecosystems. For example, fatty acid biomarkers of surface-ocean fishes and squid were found to match fatty acid profiles of the common abyssal rattail fish, drawing a decisive trophic link between the surface and deep sea communities (Drazen et al. 2009). Additionally, the concentration levels of mercury in pelagic micronekton and large fishes are a promising proxy to estimate depth of forage and to trace the transport of organic matter in pelagic environments (Choy et al. 2009; Blum et al. 2013). The objective here is to use proven biochemical markers to identify and quantify previously unrecognized trophic pathways in the Monterey Bay pelagic ecosystem. Filter-feeding gelatinous animals like giant larvaceans, salps, and doliolids mediate sinking particle flux, in some cases transporting substantial amounts of carbon into the deep sea (Robison et al. 2005). Other predatory gelatinous animals like large siphonophores and medusae directly consume micronektonic animals (e.g., crustaceans, fishes, and small cephalopods), and are in turn consumed by pelagic predatory fishes like opah and tunas (Choy et al. 2013). 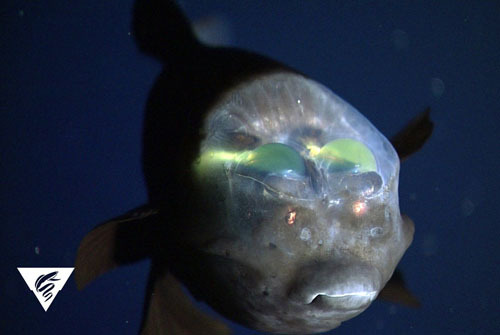 In this way, dominant gelatinous animals serve as critical trophic nodes in epipelagic, mesopelagic, and bathypelagic food webs, necessitating ecological study of their overall roles.